Have you been seeing the angel number 888? Anytime you repetitively see a number, it's likely to be much more than just a coincidence. Recurring number sequences are a common sign used by angels to communicate their guidance, love and presence. To start tuning into the angelic guidance behind the numbers, pay attention to what is happening within and around you when you see 888 or really, any recurring angel number sequence. Awareness is key because angels offer relevant guidance when you need it, or in direct response to your questions. It's likely what you're thinking, doing, or wondering when you see an angel number about will hold a big clue as to the personal meaning for you, and the guidance present within the angel number being brought to your attention. In addition, there are themes and characteristics associated with ever number. In other words, every number has a vibrational essence which carries meaning. You can learn more about the meaning of the numbers in your life through numerology, and if you'd like, I enjoyed this free numerology reading here. So Just What Is The 888 Meaning? To understand the meaning of 888 as an angel number, let's start with how it visually looks. By taking a quick look at the number 888 visually to start, it's perfectly balanced, and it reads the same forward, backwards and even upside down. This may seem inconsequential, but really it's in alignment with the meaning of 888. 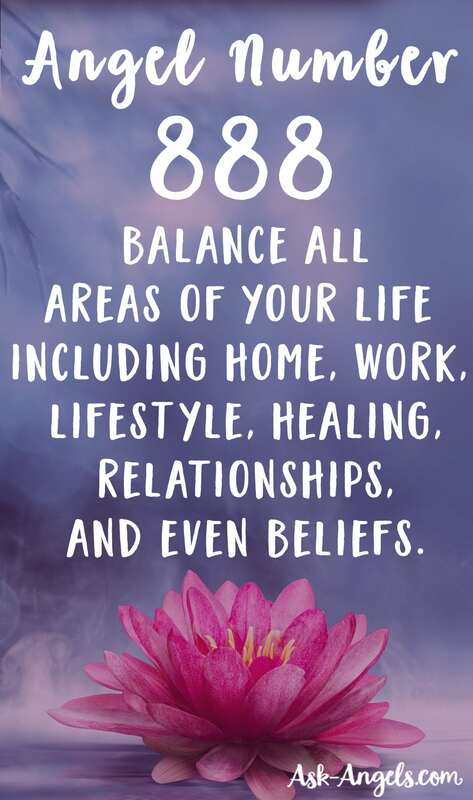 Seeing the angel number 888 is a call from your angels to bring greater balance into all areas of your life including home, work, lifestyle, healing, relationships, and even beliefs. With a sense of balance, you're then able to create something of value to share with the world. And when you do bring value to the world, you're compensated fairly and abundantly. In this way, when you see 888 it is often a good sign that there is abundance waiting for you too. 888 brings the message that your life purpose, goals and dreams are supported by the angels and the entire universe, and you will be compensated justly for sharing your gifts and shining your unique light into the world. 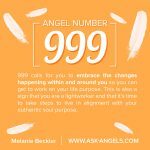 The angel number 888 is often a signal from your angels to go for it, to follow your heart and to take action upon any spiritual based or entrepreneurial career ideas you may have around the time of seeing 888, or that have been stirring in your heart. The Angel Number 888 =Abundance! 888 is a signal from the angels and the realms of spirit that prosperity in abundance is yours, and you're on the right track to bring yourself into alignment with it. When the angels show you 888 it may also mean that you've reached a level of completion in one or more areas in your life. Often the angel number 888 brings the message that something in your life needs to end or fade away soon so that you can return to balance and align with the increased prosperity in abundance that is possible for you. When you see the angel number 888 be ready for changes to unfold. 888 is a reminder from your angels that when you embrace the changes opportunities and ideas you have now they will positively improve your life. 888 is a sign you have all that you need to live a more balanced and abundant life, and that you have powerful assistance from the angelic realm in making it happen! Trust, believe, go with the flow and act upon your inner promptings to naturally tap into the cornucopia of blessings in store for you. Your angels will be with you each step of the way as you positively improve your life starting now… Take the next step! In addition to seeing angel number sequences, numbers offer insight into all areas of your life. Learn what your name and birthday say about you in this free numerology reading! Learn the meaning of more angel number sequences below! If you’re on a phone/ tablet, or to view a bigger version… Click Here or Click the Image! P.S. Have you seen 888 or other angel numbers? Was this post helpful for you? Leave me a comment below and let me know, I love hearing from you! Angel Number 999. What Does 999 Mean? One day I started seeing triple And repeating numbers. At first let if until two yrs into numbers they were all day everyday and spooky.i started looking up what this meant. I’m not sure I even know the full meaning and I sure do not know what my purpose is suppose to be and I have no idea what to do .with this being said I’m I guess it is no surprise people think I’m a nut. Please if u can help me to understand what is going on with me and what to do. I just love you and have learned so much by reading and listening to you. Been going through a very hard time, but since the summer I’ve been seeing many triple numbers. Usually 1s, 2s, 3s, 4s, and 5s. I’ll see at least 3 a day. Occasionally 8s, 1010, 1111. One time, i made a phone call, and hung up, and my cell phone said i was on for 1:11:11! Hi, I see number 8 a lot recently. Also number 7. How can that relate to my personal life if I am beeing emotionally abused by husband and feel stuck, because don’t want to break my child’s heart.. I pray a loooit for a solution. HELLO! Melanie! this is Gwendolyn,I love your meditation videos and Angels message. please! keep up the good work. ( your friend Gwendolyn Allen). SMILE JESUS LOVE AND SO DO I. This has come true my life has came to abundance thing have seen it 3 or 4 times and same as 666 and a cross do you know what a cross means?. I got 888 as my angelic number. But I don’t see the number 8 that often. The recurring number that I have seen most of my 52 years of life is 11:11. And I’ve always wondered why. This information is very interesting. As I have started to raise my frequency and invite Angels into my life in all situations, I started to notice an abundance of number sequences! Most of them are on the car licence plates. I also want to express my gratitude to what you do; I love to listen to your videos and meditations on YouTube. They have helped me in some difficult situations so much! Now, when I feel down, I know that what I need to do is raise my vibrations by listening to your Angelic messages and meditations. Thank you, Melanie! Thank you, Melanie, for helping to read my Angels' messages. I send you my biggest love I possibly can. Just wondering I haven’t noticed numbers directly, but I have been drawing a lot of the same tarot cards regardless of the type of reading I’m doing, could this be angels trying to communicate with me, I think all tarot cards have a number assigned to them? Madam can I communicate with d angels r can I see them face to face. My dearest beautiful daughter Isabella died 8/8/2015 at 8:45am aged 20 years. We asked God for a beautiful and he gave us a lot more. I’ve been seeing a MASSIVE amount of 888 everyday in any and all conceivable locations and times, including 8888… this goes for almost all the repeating numbers especially 777 and 333 and 222, and the rest 🙂 Just go with the flow and dance with the angels !! Dear Melenie,,I have been seeing the number 717 several times a day for a few years now,,I feel it is telling me something but I dont know what. Time and totals, exp dates,,in so many forms. It is worrying me. I write songs and am a affiliate of BMI its been a while but i always been writing for a long time i am not famous, my recent song i just finished writing last month i was so proud of it after i saved it, then looked at it again the was sequences of 8s in every verse from 886 887 888 889 all over my song and i know before i saved it i did not add them to it, i fixed my song again and thought to myself that was wierd, i showed friends my song and they all was like that song is awesome you need to sell that song or work on it. Then i googled meaning of 886 887 888 889 and was impressed with what i read and was like wow thats the song, i also told my friends about what happenned after i saved it and not all but some was like them just your angels, you had help writing your song thats great. And after reading what you have to say about the numbers. Thank you so much for your insight on the numbers. I am with the family right now on spring break. I can’t wait to work on it now and get started. I love the number 8. My Birthday is on the 8th. Passed my driving test(8th test, on the 8th month, year 1988)Always find number 8 very lucky in other area’s of my life as well. Been wakening up lately seeing 555 on my alarm clock. Wondering what that means? Like Dianne August 5th I love number 8 too. Thank you for your piece on 888 It was very useful to know when I’m receiving messages from my Angels. I also love your guided meditations. They are beautiful just like you. . . a beautiful spirit. You’re an angel! Thank you so much for your help and guidance. I tend to see 11:11, 1:11, 3:33 often. I recently have seen 5:55 and 444 a few times. I love your posts. They are so uplifting and helpful. I enjoy listening to the meditations and guidance that you receive from the Angels the most. I can’t believe how much my life has changed within this last year!! Keep it up. I look forward to your posts daily. Hi Melanie, from some time behind, I started seeing, 22 ,59 and 111 but lately I see all double number and like 000 to 999 or 4 numbers lke 6666. I get auncious cause i dont know what it all means. All I say is thank you Angel.